For me, the biggest appeal of Level 2 was the fact that it was written by a blogger. I was so enthralled that a blogger had been able to get her book published and, best of all, who else knew best the pitfalls that most authors stumbled across better than a blogger herself? Thus, Level 2 seemed like a novel that could do no wrong. In many ways, it couldn’t (although it’s synopsis seems to think it’s going to get more readers by hinting at a love triangle when there is no love triangle in this story at all). Yet, despite the unique concept, excellent writing ability, and creative characterization, it is disappointing to note that Level 2, is, after all, missing something. What Level 2 excels in is its characterization. From the very beginning, we are thrown into memories of Felicia’s past and through her eyes, we re-live her romance with Neil, a budding and beautiful story, her fall out with her best friend, her days spent making out with Julian without telling her best friend, her strained relationship with her parents…we see it all. We witness Felicia’s ups and downs and although it all comes together very slowly, the pieces of her traumatic past and her ultimate death seeming to take forever to unfold, it’s worth the wait. I love that Felicia is a flawed and unlikeable protagonist; I love that it is her who is the bad guy, the one who messed up, the person who is wrong. Yet, what I love most is that we can see that it isn’t all her fault and that, deep inside, just as her boyfriend Neil sees, is some good. In this manner, Felicia is one of the most in-depth characters I’ve come across and her relationship with everyone, from her friends to teachers to parents to her own boyfriend, are all richly complex and a thrill to read. Even her unfolding romance, one that is endearingly sweet, only adds to the multi-faceted characterization of Appelhan’s protagonist and really, it was this aspect of the story that truly made Level 2 such a powerful novel – the part of it that resorted to becoming a contemporary tale. Unfortunately, however, Level 2 is a science-fiction novel and it is in this genre placement that the novel falters. While the mystery of Felicia’s past kept me flipping the pages in anticipation, forming bonds with the characters and barely containing my excitement to find out what really happened, the present action of the rebellion utterly lost my interest. Felicia, with the help of Julian, essentially explores the place known as Level 2, breaking the bonds of the regulations set forth there and attempting to help her friends. I hate to say it, but this so-called “action” was extremely dull. Furthermore, with the exception of witnessing ones memories from the past, there were no truly innovative gadgets or sci-fi elements to this novel, which was a huge disappointment. I could, perhaps, forgive all this for the plot twists were superb and much of the novel is focused on the past, not so much the present, but the ultimate ending was rushed. It had an engaging plot thread, concluding with a plot twist that had quite an element of surprise to it, but then the rest of the novel, to its rather astonishing ending, was a blur. 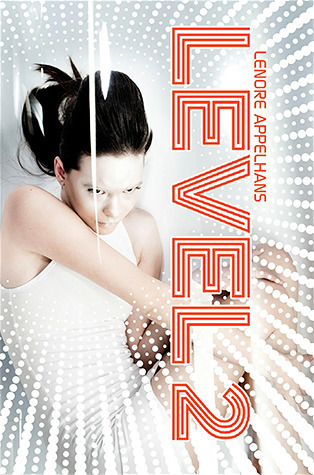 Thus, I have to say that Level 2 is a novel that I’d more recommend for contemporary instead of science-fiction lovers. Perhaps if you are new to the sci-fi genre, Level 2 will captivate you in a manner that this novel failed to captivate me in, but if you’re more looking for hard-core sci-fi, I’d suggest look elsewhere. Nevertheless, I thoroughly enjoyed reading Appelhans’s debut and with her strong characterization, unique thought-processes, and lush writing style, I am already eagerly anticipating her next novel. A slight change of expectations can render this novel a definite favorite among many and joining the ranks of authors to look out for is Lenore Appelhans – without a doubt. I was given a copy of this book on behalf of DAC ARC Tours in exchange for an honest review. Thank You! Great review!!! I'm really looking forward to reading this book—it sounds amazing. I actually quite like how you'd recommend it for people who like contemporary. I like sci-fi and contemporary, but lately I've really been on a contemporary binge! Per our earlier conversation, we both ended up with similar ratings for this one, although it's interesting how different our reactions are to the material! I agree that readers who don't normally read a lot of scifi might really like this one, though, and I appreciate how balanced your review is. Great review, Keertana! I was impressed with the fact that a blogger got her book published, too! And I guess this is for me, seeing as I am a contemporary fan. I have a copy and plan on reading it soon. Felicia sounds like an excellent character, Keertana, one that I definitely need to get to know despite your issues with this book. I always struggle with unlikable heroines, but if there's some goodness that shines through, than I'm sure I'll manage to form some link to her. I'm very interested in this one, but I'll definitely pick it up with lower expectations. Thank you for yet another amazing review. I think I'm still eager to read this one even though it missed that special something. I do like my science-fiction, but I think I'd give it shot anyway and see what I can make of it. I think most books are worth giving a chance. The characterisation sounds brilliant and I like the idea of the plot being set on different Levels. The main appeal for me, in regards to this book, was the fact that it was published by a book blogger. I was hoping that she would manage to tread over all the common mistakes in YA books, and although it seems like in some cases she did, she didn't in some other ones. It sounds like this book is just like If I Stay. Maybe it's because I just finished that novel, but with all the flashbacks and such, and a lack of plot, it definitely seems like this is just like If I Stay. Fantastic review as always Keertana! I think I'll still be giving this one a try, but with some adjusted expectations. Love that it's written by a blogger too, and am glad to hear the characterization was good. Might just pick it up when it's published. Great review, Keertana. Thanks for sharing. That is really cool that a blogger has gotten published and, like you said, who better to get published who is able to have a solid understanding of the publishing and promotion process? I am glad that the characters and story in general worked well for you. As for the sci-fi aspect, that's too bad that you found it to be a little lacking. While I agree that the mischaracterization of the genre would be frustrating, at the end of the day a book needs to contain characters and a story I care about and it sounds like those aspects are good. Maybe your review will reach enough people so that their genre expectations can be altered and they'll be able to enjoy the book from that perspective. Wonderful review! Thanks for this fantastic review Keetana. I've read some reviews already but you've given me a different take. While I'm not a big contemporary fan, I'm also not a big sci-fi fan so this sounds like it might suit me. I had no idea Level 2 was mostly a contemporary novel, thanks for letting me know, Keertana! The concept for this story definitely sounds unique with it's past and present tense parts. I'm quite sad to hear that the supposed 'unique' part of the novel was the also the dull one. However, hooray for the in-depth characterization! Great character development always saves the day. Even though there were some flaws in this book, I'm thoroughly impressed that a blogger was able to write this intricate novel. I think I'll still be picking this one up soon, thanks for the beautiful review, Keertana! I honestly mostly wanted to read this book because Lenore wrote it and ive been familiar with her blog for awhile. I'm ok with it being light on the Scifi aspects and hopefully whenever I read I will enjoy it. Thanks for explaining things, like how it works, cause I didn't feel like I really knew what it was about. Did you know that you can create short links with AdFly and get cash for every click on your shortened urls.